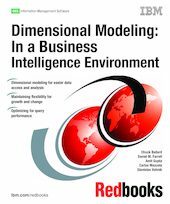 In this IBM Redbooks publication we describe and demonstrate dimensional data modeling techniques and technology, specifically focused on business intelligence and data warehousing. It is to help the reader understand how to design, maintain, and use a dimensional model for data warehousing that can provide the data access and performance required for business intelligence. Business intelligence is comprised of a data warehousing infrastructure, and a query, analysis, and reporting environment. Here we focus on the data warehousing infrastructure. But only a specific element of it, the data model - which we consider the base building block of the data warehouse. Or, more precisely, the topic of data modeling and its impact on the business and business applications. The objective is not to provide a treatise on dimensional modeling techniques, but to focus at a more practical level. There is technical content for designing and maintaining such an environment, but also business content. For example, we use case studies to demonstrate how dimensional modeling can impact the business intelligence requirements for your business initiatives. In addition, we provide a detailed discussion on the query aspects of BI and data modeling. For example, we discuss query optimization and how you can determine performance of the data model prior to implementation. You need a solid base for your data warehousing infrastructure . . . . a solid data model.